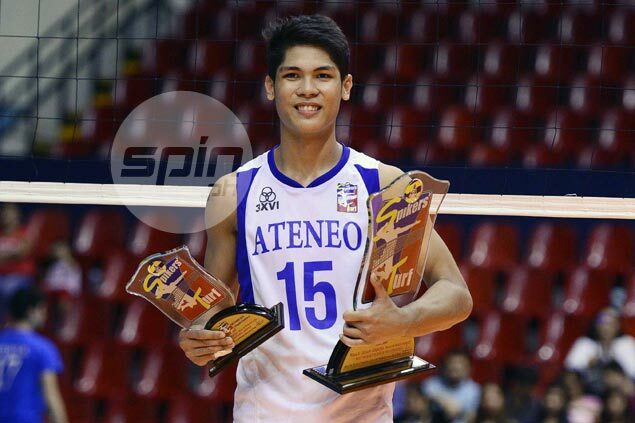 ATENEO’s Marck Espejo was named Most Valuable Player for the second straight season after leading the Blue Eagles to another conference sweep with their conquest of the Spikers’ Turf Second Season Collegiate Conference. Espejo also won the First Best Outside Spiker honor to go along with his MVP trophy, which he also won during the first season. "As I said before, he's a gift from God to Ateneo," said Ateneo head coach Oliver Almadro on his ace player. But Espejo played down the praise, and thanked his school's program and all out support for making their success possible. "Sobrang supportive lang ng Ateneo program, yung office of Athletics, sobrang supportive sa sports. Binibigyan nila ng oras mag-ensayo. Lahat ng kailangan namin binibigay nila," Espejo said. Meanwhile, two other Ateneo players also brought home individual awards, as Esmilzo Polvorosa bagged Best Setter honors and reinforcement Tony Koyfman was named Finals MVP. Other awardees include La Salle's Raymark Woo for the Second Best Outside Spiker and Rafael Del Pilar for the First Best Middle Blocker award. NU's Madzlan Gampong took home the Best Opposite Hitter award and his teammate Kim Malabunga won the Second Best Middle Blocker award. University of Santo Tomas' Lester Sawal took home the Best Libero honors to complete the awardees.